This topic contains 6 replies, has 2 voices, and was last updated by Alexander Bautz 1 year, 3 months ago. I have used the org chart successfully with SharePoint 2010 and IE11 but this latest one I’ve created seems to hang at “filtering”, it works fine in Chrome apart from the fact that I can’t edit the chart in chrome. 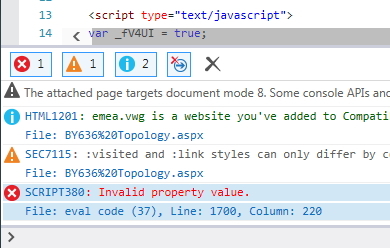 In IE11 When this happens I get a script error at line 1700 when using F12 debug. This topic was modified 1 year, 4 months ago by Phil Grant. What kind of filter are you using on the org chart? What is it that’s not working in Chrome? – it should be 100% compatible. In IE I’m filtering on the first and second columns, IE will render the chart when I filter on one of the columns it but hangs when the filter is set to “all”. It works in chrome but the edit buttons are greyed out for the Web page, probably not a chart issue. The only other thing I can think is the contents of the columns contains German and may contain umlauts etc, this shouldn’t be a problem though .. should it? Could it be that the org chart is to big? IE havs trouble rendering large org charts due to restriction in the number of columns it can have in a table (yes, the org chart is drawn as a large table. Yes I suppose it could be the column count that stops it, there around 180 columns. One strange thing I’ve noticed is that in Firefox and Chrome I get no right hand scroll bar when I view the org chart, there is a ghost of the scroll bar but no way to use it (Greyed out) the scroll bar appears as normal in IE11. You can try setting the height of the chart in the “Options” tab to fit the maximum size of the org chart.